Eamon Grennan was born in Dublin, Ireland in 1941. After receiving his B.A. and M.A. from University College in Dublin, Grennan moved to the United States to attend graduate school at Harvard University. He earned his Ph.D. in 1973 and began teaching at Vassar College the following year. Grennan continued to teach English at Vassar until his retirement in 2004. 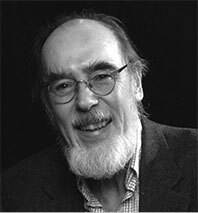 During his career, Grennan has published twelve volumes of collected poetry in addition to the large number of poems published in journals and magazines such as The New Yorker. Grennan has also been involved in editing volumes on Irish poetry and translating others' works. MARBL staff are in the final stages of arranging and describing Grennan's personal papers, which include a bit of correspondence, manuscript and typescript drafts of his poetry, drafts of prose pieces and translations, notebooks, diaries and printed material. One of the most interesting things about the collection is the evidence of Grennan's writing process. Often with literary archives, evidence of a writer's process gets lost over time. However, Grennan's papers are unique in that his process is apparent in the numerous drafts present for each poem and each collection. Materials for most collected works include folders titled “Towards [work],” as well as other files that show his early efforts at crafting a collection. 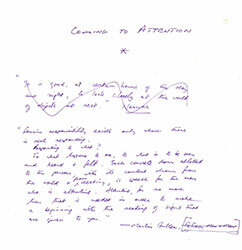 Many works also include multiple typescript drafts of the collection, some with up to four variant titles, indicating the amount of thought and care that Grennan puts into the writing of his work. Researchers using this collection will be able to track the work of the poet virtually from the birth of an idea through the final stages of the publishing process. The collection also includes much evidence of Grennan's close ties to the literary community. Grennan not only wrote and published poetry but also wrote reviews of other poets' works. His strong relationship with his colleagues can be seen in the inscriptions of poems sent to him. 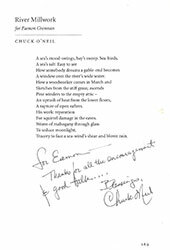 Poets, including Paul Muldoon, Peter Fallon, Chuck O'Neil, and Dana Gioia, sent him copies of their work with kind words. His relationships with editors and other members of the literary community can also be seen in his correspondence, particularly in letters between Grennan and publisher Peter Fallon. The papers will be re-opened to researchers early next week.